As a parent, it’s sometimes hard to know if your kids are really listening to you. There is plenty of anecdotal evidence to suggest they aren’t. So when Natalie would tell her 6-year-old “You could crack your head open!”, she wasn’t sure if her daughter was getting the message. Now she’s sure. GN was definitely listening. And then some. 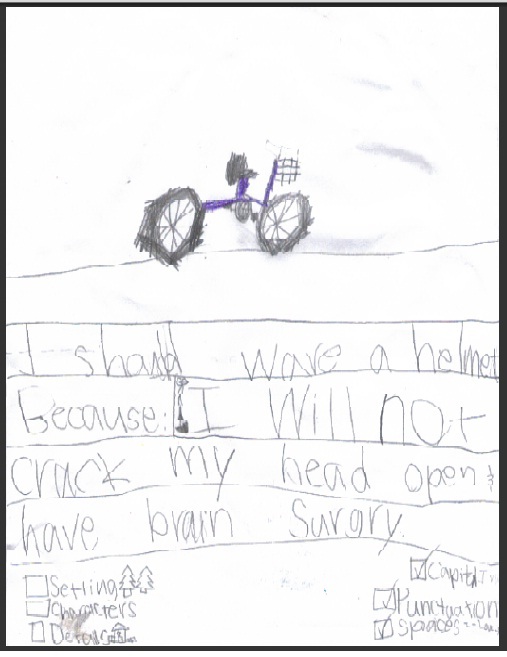 I should wear a helmet because: so I will not crack my head open & have brain surgery. The National Council for Scaring Children into Practicing Healthy Habits has found its newest spokesperson, and, for a minimal appearance fee, GN is available to talk to your children about wearing their helmets, as well as other topics, such as eating their vegetables, toothbrushing, and crossing their eyes. And you can’t imagine what she has to say about BB guns. Please include an image of the stuff, the kid’s name or initials, and the kid’s age. Also, if you have something linkable, we’ll be happy to link to it. Thanks! Posted on June 28, 2011, in School Assignments and tagged Bike helmets, Brain surgery, Chase McFadden, funny writing, Humor, Ironic Mom, kid writing, Kids, Leanne Shirtliffe, Some Species Eat Their Young, Stuff Kids Write, Stuffkidswrite.com. Bookmark the permalink. 94 Comments. Pools are prime for cracking heads open. What I tell my niece and nephew…you crack your skull in the pool and you can’t cry b/c if you do you’ll drown. Seems to have worked. 🙂 Fun post…I will have to submit some of thier stuff to you guys!!! What her work lacks in setting, characters and details, it more than makes up for in capitalization, punctuation and spaces. She even used a colon correctly! This former English teacher is impressed. As her mom noted in the email submission, there is definitely one character involved here, and that’s the writer. And, yes, her writing is very impressive. She’s been paying attention to her mom and her teacher. I love her checklist at the bottom, too. Not only will she not crack her head open, but she knows the value of proper punctuation and capitalization. The checklist is terrific. GN’s mom said that it’s the same one the teacher uses, so she just did it for herself. I would like to “like” all of your comments, but it isn’t an option. This girl is my daughter, and grammar is a very important thing in our house. I shudder to think what language will be in ten years. If she keeps up the good writing she can be an English teacher someday! With writers like this coming along, I think that our language will be just fine in ten years. Thanks for sharing this, Natalie. I really hope Natalie saves that for her graduation party. That is a priceless piece of artistic advice! If she can get her draw other healthy anecdotes I bet you could sell them for greeting card covers or school posters on safety. I would absolutely buy this. Congrats on having SKW be Freshly Pressed! It would look great on a t-shirt. Thanks! And thanks for commenting. lol, this is awesome! and she DOES listen! If my kids listened this well, I cringe to think what they’d write. Thanks for stopping by the site. Hilarious, I love it. Kids are so honest and (usually) more realistic and accurate than adults. More entertaining anyways! Brutally honest. One of their greatest attributes. Thanks for checking out GN’s writing. Thanks. The checklist is outstanding. haha 🙂 A very good spokesperson indeed. Very good. I started wearing my helmet around the house after reading GN’s advice. Thanks for coming by. Only a smeer of peanut butter? That’s outrageous! I’d write a note of complaint, too. Chase and Leanne: Congrats on getting the new site some publicity with a little Freshly Pressed action. This is a good one, and a valuable lesson for all kids. Let’s avoid brain surgery wherever possible, right? Wickedly and brilliantly funny! GN deserves this prize of freshly pressed! Next thing you know she’ll be a WordPress spokesperson! Congrats to her. Now we want to see this drawing! Thanks, Kathryn. Yeah, this is GN’s show. We just post ’em. WOOHOO!!! Congrats on making FP!!! Aww how cute! It’s so amazing how kids soak up so much of what you say even when you think they’re not listening. I used to nanny and I loved helping the kids with their writing assignments because you never knew when they would produce something brilliant like this! They write just like they talk: straight from the hip. Thanks for stopping in. See it sinks in sometimes! Sure does. Thanks for checking out GN’s brilliance. I’m sure she’s happy knowing her daughter actually listens. Yes, any acknowledgement from my brood that they hear me would be nice. Thanks for commenting. Very. She’s the kid you want hanging with your kid. that’s hilarious! my son is 2 and a half, and is currently in mimic mode. he retains just about everything that comes out of my mouth, although he may not understand. it’s funny to try and talk through things with him in a way that he can comprehend. i love it! Funny. The parrot stage. They don’t miss much, do they? Thanks for commenting. Absolutely. GN is going places with that attention to detail. Thanks. Smart kid. We didn’t have helmets when I was young. It just goes to show they actually take it all in. Good point. Even when it doesn’t seem like kids are listening, they are. Great to see you guys on Freshly Pressed! So lovely to see you on Freshly Pressed! I still laugh at one of the first posts of yours that I read where your son talked about his cherry juice and where it was at the dinner table. It kept me laughing out loud for days! I’ll have to dig a little deeper into the Kids Stuff Write but I’m sure I’ll love it. Congrats! Thanks! Great to hear from you. Yes, the infamous cherry juice/wiener incident… (head shaking). I think you’ll like the site. The kids have great stuff. I grew up with my mom using the same exact “scare” tactics! I’m still unraveling some of the less than factual things she would say would happen if I wasn’t careful or didn’t follow the rules. Really enjoy this blog..
I’ve been trying to get my finger stuck up my nose for 37 years, but so far it hasn’t happened. Those moms… Thanks for checking out the site. That is adorable! It’s funny what information is actually retained because it does feel like you’re talking to a wall sometimes. Silly kids! Very true. Kids really are sponges, soaking it all in. Which would be pretty handy, actually, if there was an actual skull-cracking incident. Thanks for commenting. Indeed. Thanks for dropping in. I’m glad that they also drew a bike because if they just started talking about wearing helmets and having their heads not crack open, I’d be a lot worried about their mental state. Undervalued is GN’s artwork. That is a seriously-awesome bike. Thanks for checking us out. It is a really good bike… maybe too good. Now I’m suspicious. great advise for my cousin who recently split his head open, cool post. Maybe GN can give him a call. Thanks for commenting. Hey if you wear a helmet on bikes as a kid, Adults should wear them on motorcycles too! IN IL we don’t have a helmet law. GN might be able to help with that. She has real lobbyist potential. Thanks for commenting. Love what GN wrote! Now if only we could have had that fellow who was busily protesting wearing helmuts on motorcycles read it before he crashed, hit his head and passed on. Some kids are smarter than adults! True. Thanks for checking out GN’s masterpiece. It looks as though you and your child have the same handwriting…I heard it’s genetic! She needed GN at her side for reinforcement. She’s convincing. Thanks for commenting. Thanks for checking out GN’s writing. Mission accomplished, well done on FP too. GN is amazing. Thanks for stopping by. Thanks for dropping by SKW. So true. Thanks for clicking over. GN is impressive. Thanks for stopping in. I sometimes wonder was I just as impressionable when i was a kid… !?? Good question. Thanks for checking out the site. Great site! Kids always manage a way of getting right to the point. Thanks. They cut out the fluff, don’t they? I’m sure I’ll will! Kids are just amazing in their own ways!